In a medium skillet preheated over medium heat, grill the sausages in half of the duck fat for 7-8 minutes. Remove the pan from the heat and set aside. Remove the fat from the top of the duck breasts, then slice each one in half through the middle to make cutlets. Place the cutlets between two sheets of wax paper and pound with a flat mallet until they are big enough to cover the sausages (about 10 cm x 15 cm (4 in. X 6 in)). Brush with as much mustard as you like. Roll up each sausage inside a duck cutlet, then cover the roll with a few slices of bacon laid in the same direction as the sausage. Seal each surprise with a piece of kitchen twine and place on a plate. Season to taste with salt and pepper. 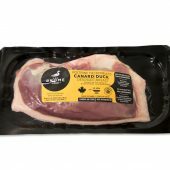 At this stage you can either cover the plate and refrigerate the duck surprises up to 24 hours or continue with the recipe. If you prepared the duck surprises in advance, take them out of the refrigerator 90 minutes before cooking. In the same pan used to grill the sausages, or in a new one, heat the remaining duck fat over medium-high heat. Add the duck surprises, and grill for 7-8 minutes in total, turning several times. Remove from pan and place in the oven at 110 °C (225 °F). Make the raspberry and dark chocolate sauce. 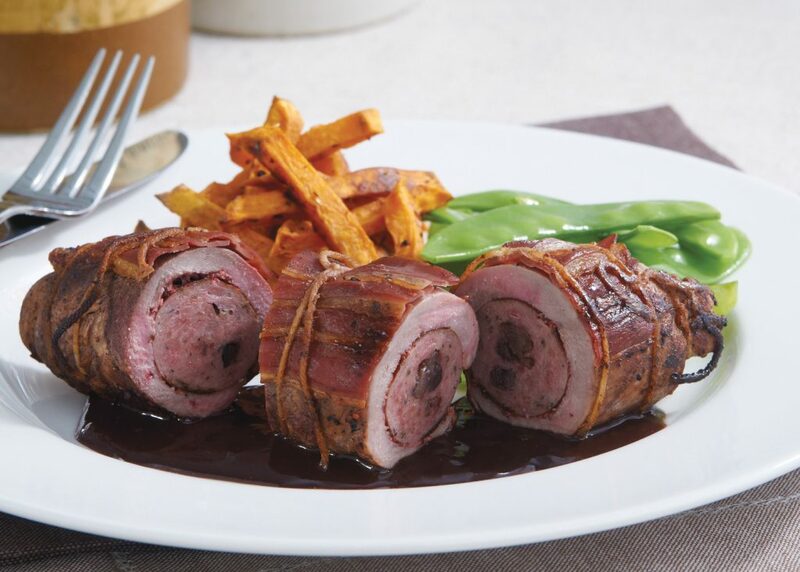 Serve immediately, laying one duck surprise per serving on a base of raspberry and dark chocolate sauce. Serve with homemade fries and snow peas. In the pan used to cook the duck surprises or in a new one, sauté the shallots in the duck fat for 2 to 3 minutes over medium-high heat, stirring. Deglaze with the raspberry vinegar and reduce for 1 minute, scraping the cooking juices. Add the raspberry jam and the duck stock, then bring to a boil. Let boil for 2 to 3 minutes, stirring. Add the chocolate chips and then turn off the heat. Mix, then remove the pan from the heat. Let sit for five minutes before serving with the duck. If not serving immediately, store the sauce in an airtight container in the refrigerator and reheat just before serving. You can find a wide selection of fine mustards in specialty grocery stores. Choose a fruit-based mustard that will go well with duck.